While I am packing up my house for out move and while we start our travel to WI, I have a couple friends guest posting here and there for me. 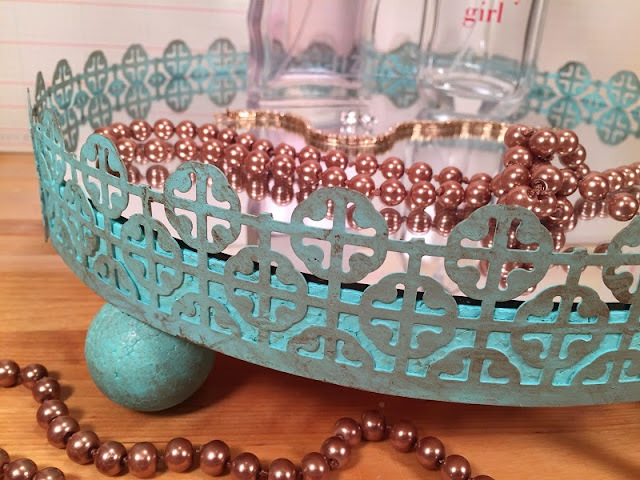 Today, Beth from Beth Watson Design Studio is here sharing a great idea on how to make a vintage inspired mirrored dressing table tray. 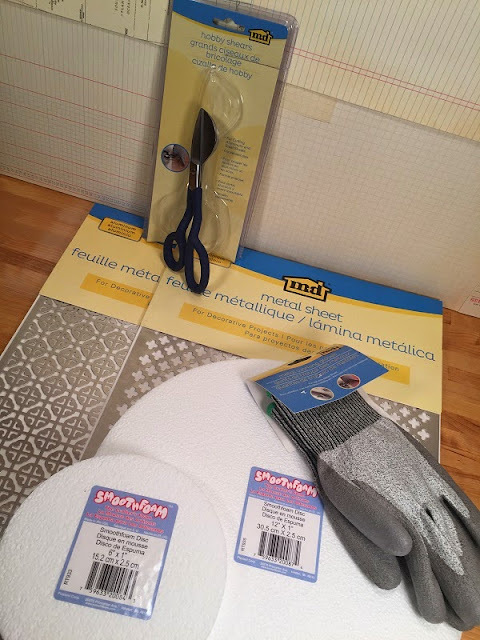 Wearing M-D Hobby and Craft Gloves, carefully cut your pattern from the Mosaic Perforated Aluminum Sheet with Hobby Shears. 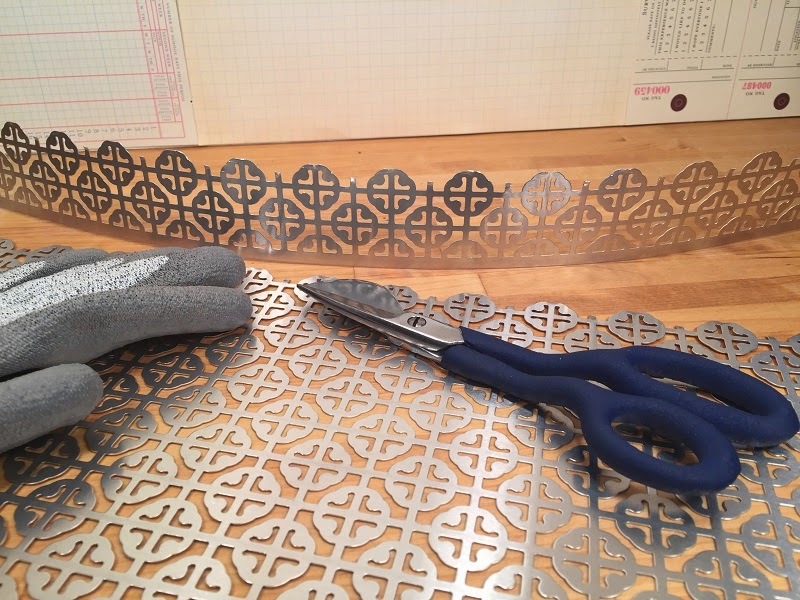 Repeat and cut a second pattern, leaving the finished straight edge along the 2' length of both pieces. Using needle nose pliers, turn over and crimp tightly each of the metal "tabs". Dry fit both strips of Mosaic Perforated Aluminum Sheet around Smoothfoam 12" Disc. 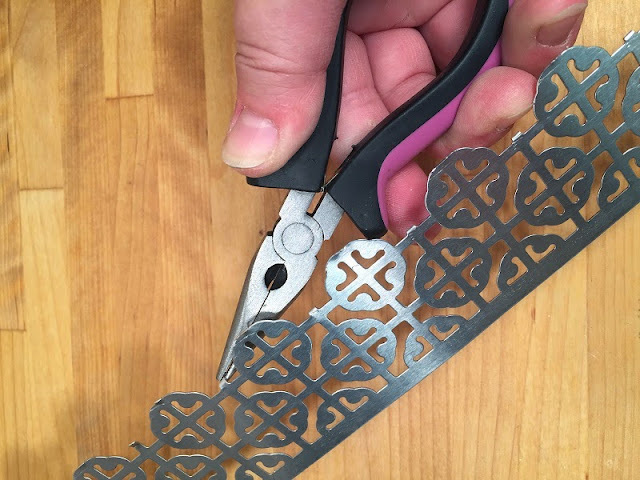 Trim metal with Hobby Shears to match pattern at joints. Have rubber Bands ready. Apply generous layer of MONO Aqua Liquid Glue around outside edge of Smoothfoam 12" Disc. Wrap around first strip, then second strip of Mosaic Perforated Aluminum Sheet. 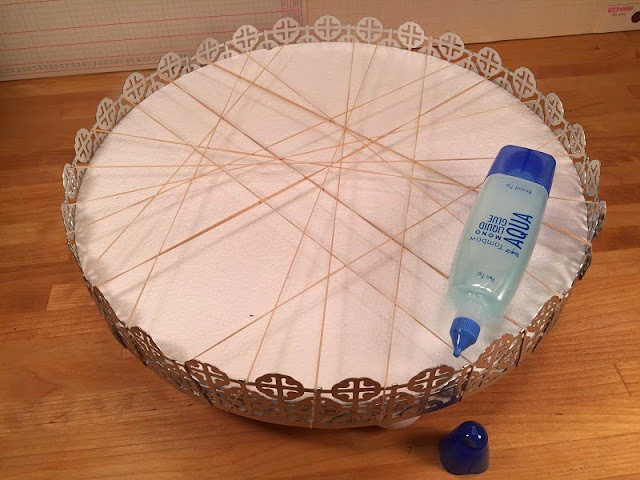 Secure with rubber bands and let dry completely. Remove rubber bands and place newspaper on work surface outside (or in a well ventilated area inside). Spray paint embellished disc and 4 Smoothfoam 1 1/4" Balls with Design Master Colortool Robin's Egg. Use several light coats to get proper coverage and avoid drips, let dry completely. 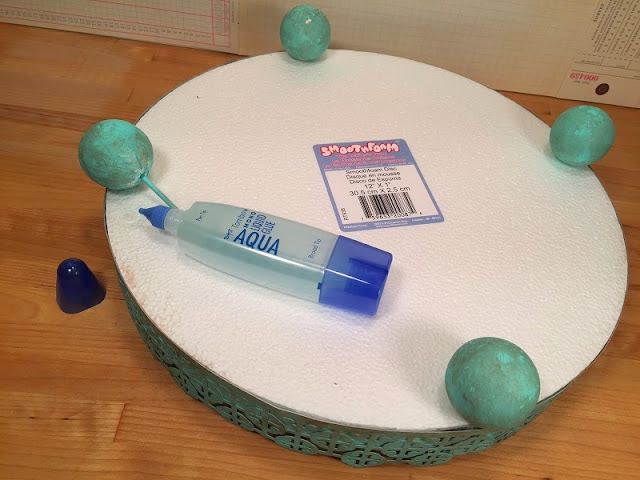 TIP: Insert skewers into bottom of Smoothfoam Balls, then into a cardboard box lid to keep the balls from rolling around when sprayed. Flip embellished disc over. Trim skewers to 3" long. 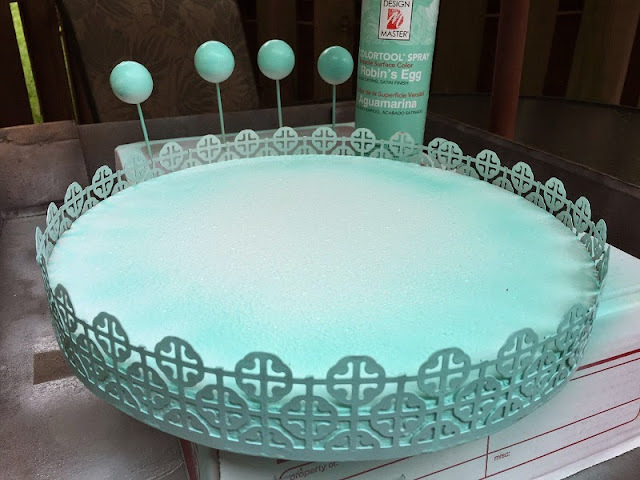 Secure one end of skewer in ball and the other end into disc at 12 o'clock, 3 o'clock, 6 o'clock and 9 o'clock using Tombow USA MONO Aqua Liquid Glue, let dry. 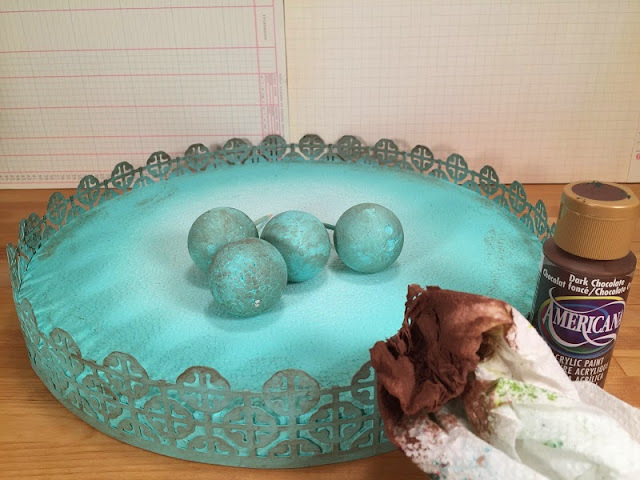 Distress finish with wet paper towel dipped in Americana Paint Chocolate Brown by rubbing in nooks and crannies, then buffing with a clean paper towel. 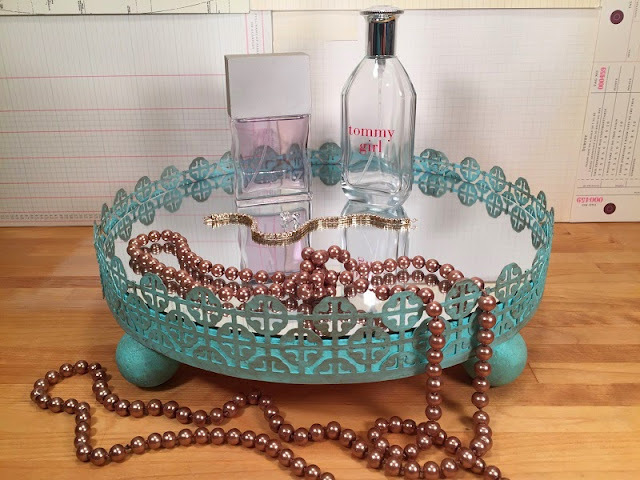 Insert mirror, securing with glue, then place on your dressing table to organize perfumes and jewelry!